Free advice on how to fix your bicycle: We make it on MAKE's top 10! We make it on MAKE's top 10! Wow what a kick. A recent post on the MAKEZINE blog list the top 10 homebuilt recumbents and 2 of my creations make it at number 5 and 6. Too bad that number 5 was a failure but I did learn a lot while building it. There are two things to remember when trying to build your own recumbent, the R&D is the fun part and when in doubt, overbuild. You'll always come out on top. 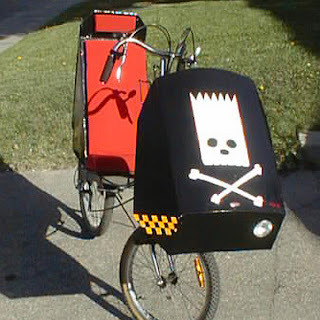 The Bart Simpson fairing served on 2 of my creations. The one pictured being the worst. The fairing was made of Coroplast held together with Duct tape and silicone. 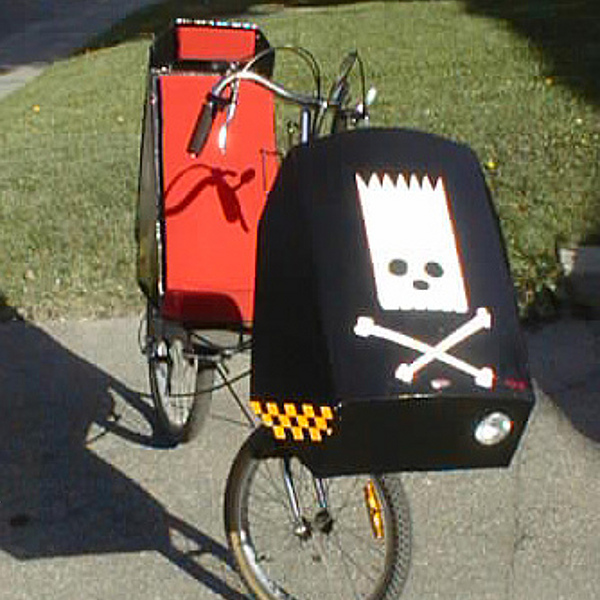 I had painted the whole thing black and made the Bart skull from reflective vinyl. It worked great and never went unnoticed. I made quite a few fairings and tail boxes out of coroplast. All of them were inspired by Bill Volk's coroplast craziness page on ihpva.org. and you can always download my free bike repair book here.